Bakugan Battle Brawlers Card Game comes with everything in photos. Everything is in excellent used condition including instruction booklets. Figures open with magnets when lightly tossed on top of cards. Shipped with USPS First Class Package & Tracking. No returns. Ultra Cards - 125 128 129 135 145. Hologram Cards - 4 12 14 15 22. Story Cards - 87 106 107 108 109 110 112 114 121. Mint to near mint condition. 2 Super Rares. May see duplicates if you order multiple lots. They are used to represent your possibilities since this is a random lot and no single picture will show exactly what you are getting. 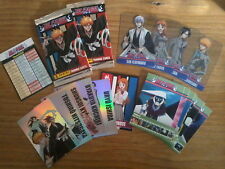 Zatch Bell Card Game Bundle Lot (42 cards; some Duplicates). Condition is Used. Shipped with USPS First Class Package. LORD OF THE RINGS CCG. 300 CARD LOT. Most of these are from 2001-2002. Convergence Complete Common Set. Star Wars: Destiny. Doomtrooper Paradise Lost Expansion 40 cards no duplicates. Condition is Used. Shipped with USPS First Class Package. Darkus Stinglash 300g. Pyrus Blade Tigrerra. Subterra Gorem 400g. Translucent Reaper. Olive Green Singlash 450g. The cards are mostly in slightly played condition, but a few may have marks or scratches. Actual cards depicted in photos. Plus loads of commons and uncommons from various sets. World of Warcraft Huge Job Lot. March of the Legion box contains two decks of 37 and 32 cards. Complete Molten Core (no treasure). Be sure to check out the. Local pickup is always available. All 4 deck boxes are full of cards but not sealed, plus the singles you see in the photos. Cards look to be in very nice shape and hardly used. (see photos) Great lot for your collection! All my card lots are being sold as-is. You will receive everything pictured! 4 BOXES FOR 16 This is a full 930 card storage box of random Cardfight Vanguard singles. These are mostly commons and a little higher with some promos mixed in. These are all random with a mixture of various set. This box had two sets of cards inside it for a total of 64 cards. My assumption is this is 2 decks of 32 cards each. There are 4 different holographic cards in the set (shown in the second photo), and the box says 2, so that is why I believe there are 2 decks. Lot contains two open starter decks, several loose boosters, and a Feast of Winterveil set featuring 12 cards and a deck box. Overall in great condition and perfect for any WoW TCG collector. Pictures are of actual item. 75 commons. This is a random lot of 100 VS system cards. This is BY FAR the cheapest way to start a collection compared to booster boxes or random lots full of doubles. The cards on in good condition. Mint to near mint condition. They are used to represent your possibilities since this is a random lot and no single picture will show exactly what you are getting. I am more than happy to give any information needed. There are at least 7 Starter Deck (55 cards per deck) in this lot. I do not know anything about them so they are not picked through. In the photo the deck boxes are empty, I will fill them for transport. Dragon Ball Super Card Game ! Lots de 100 cartes avec Brillantes !! Faites donc plaisir à vos enfants avec cette petite idée cadeau ! See 1st photo for what cards are included in joblot. None have been scratched. I Picked used instead of new as they have been removed from their packaging. I don't know what year they are from. Listing is for a complete set of all commons and uncommon from the Decipher Star Wars CCG Hoth expansion, a total of 108 cards. Card condition ranges from lightly played to NM. Star Trek CCG. 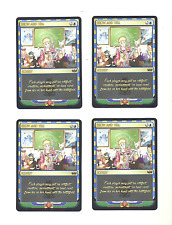 30-40%Premier White Border, Alternate Universe and Q Continuum. 160 cards, including common and uncommon and approx 10 rare. 5-10% Premier Black Border. 10% Deep Space Nine, Dominion and Blaze of Glory. 127 of the 180 cards are included here (one of each). The missing cards are All cards other than those listed above are included in this lot. These are all near mint - unused, just collected. Over 240 Legend of the Five Rings Cards - Black & Green Backs. the Jade Edition instruction booklet. I don't know if these cards. This is an over 240 card lot of Legends of the Five Rings cards. Most of the cards. 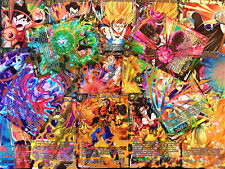 (10) Dragonball GT cards to power you up as pictured. 8 are foil, one Dinner Date and the Aerial Elusion are not foil. Be sure to check out the. Local pickup is always available. BATTLECARDS / SCRATCHCARDS. STEVE JACKSON. MISSING CARDS NO. 3, 7, 17, 20, 23, 25, 31, 39, 52, 54, 57, 66, 78, 85, 93, 96, 99, 119, 125 & 127. ALSO MISSING ALL TREASURES CARDS. Refer to the picture to see them from the side. 39pcs Bakugan Toys Cards set (all unopened except 1). - BONUS 1pcs sports wrist band (sweatband) with Bakugan Logo (also worn/washed once). • Bulk wholesale pricing. • There are a total of 39 pieces. Local pickup is always available. Unsorted, unchecked, All I did was count and put 100 in each baggie. Pack pulled and never played. Check my feedback and buy with confidence. World of Warcraft TCG lot of 30 A Question of Gluttony promo cards. Star Wars Premiere CCG *extra card packs included*. Condition is Used. Spring cleaning find! Cards, plastic insert, rules, and instruction manual are all in tip-top shape! Box is still sturdy and in good condition with the exception of two taped corners on lid, wear around edges. Please view photos as they constitute part of the description. Thanks and have a great day! 61 Cards, No Repeats, All in sleeves, No Holos. Set Missing the Following Cards. WoW TCG Scourgewar Icecrown collection box in like-new condition. Also comes with some other opened packs. All cards a mint and never played. Bought this a while back, opened the packs, and put it all back in the box. The mat and dividers are still sealed. Sadly, there were no loot cards. Will ship USPS upon payment. I will not be offering returns on this item, so please contact me with any questions before bidding. Thanks for looking!